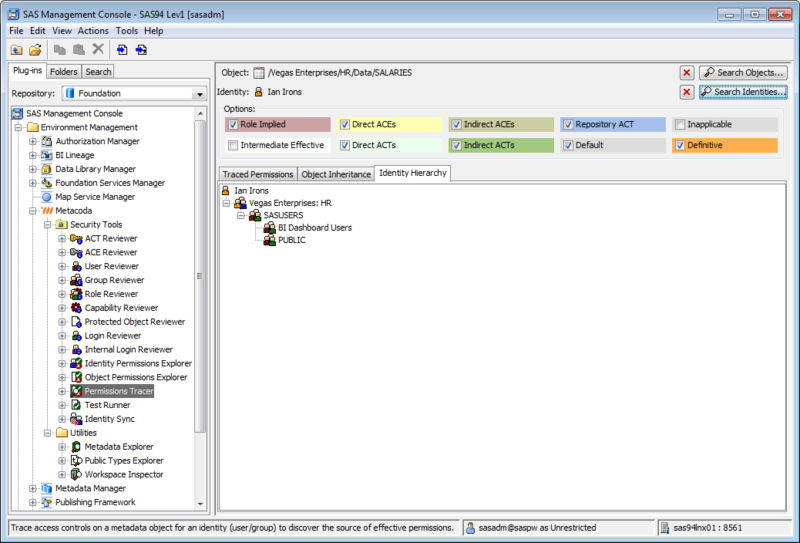 The Permissions Tracer is included in our Metacoda Security Plug-ins software. It is used to easily review the relevant access controls and permissions for the selected identity on the selected object. 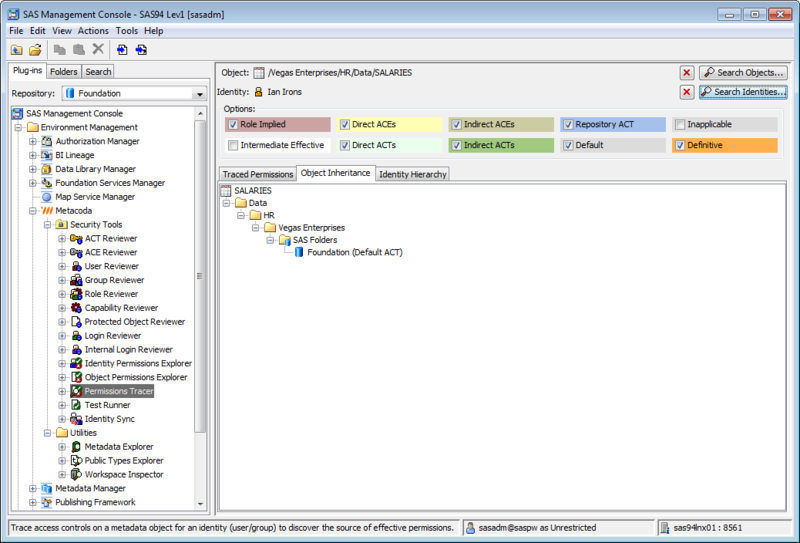 Traced Permissions table: listing the relevant access controls and permissions for the selected identity on the selected object. Object Inheritance table: displays a reverse tree, starting with the selected primary object, and showing all of the other objects that the primary object can potentially inherit permissions from. Identity Hierarchy table: displays a tree showing all of the groups that the select primary identity is a member of, including all nested indirect groups, and the implicit PUBLIC and SASUSERS groups. Search facility: click search button to search for and select an object to trace permissions on. HTML export: all of the information available in the Permissions Tracer can be easily exported in HTML format for documentation, audit and troubleshooting purposes. Discover the source of effective permissions. Easily document the effective permissions for an object with/without an identity within a metadata security plan. Then regularly verify the current implementation against that plan, identifying any changes or concerns. The Permissions Tracer is available in our Metacoda Security Plug-ins Premium and Enterprise level packages. We offer three license package levels: Starter, Premium and Enterprise. Read our licensing page to find out which package is best for you.